Future giveaways will be announced first in my e-newsletter. Subscribe today. I’m a writer. I’ve written news reports, magazine articles, books, among other things. How hard could it be to write a blog post? The actual writing wasn’t hard. I had plenty to say about a lot of things. That’s the crux of my problem; I want to write about everything and anything. I had no direction, no purpose, no reason to blog. The reason for my original website, which became a blog, was to sell my books and promote speaking and editing. Just throwing up anything I vomited on the screen wasn’t going to fulfill that reason. I needed help. Learning more about blogging and making it work for me became a priority. Now I have a problem in this area as well. I can research a subject to death, and then go on. I started buying up books and taking courses. Most actually said the same thing: find a niche, write a post, and promote on social media. All sounds good, but I needed more details—a plan. Then I found Profitable Blogging for Beginners from Blogelina.com. Tanya at Blogelina has developed a course that goes beyond the standard fine, write, promote formula. She actually takes you step by step through the process of making your blog profitable; in other words, fulfilling the purpose. The class includes four weekly online classes (Tuesday, 8:00-9:00 p.m. EST), a sixty-page manual, one-year free web hosting, free blog set-up, and more. One feature that has been great for me is if you can’t make the Tuesday evening live class, you will receive a follow-up e-mail with links to the class recording, a list of questions asked during the live class, links for networking with other bloggers, and resources. Even better, these links don’t go stale. I’ve gone back and listened to a class again to make sure I’m on the right track. The class workbook is worth the cost of the class. The sixty pages are full of easy to follow information and action items that even the newest blogger can do. And more links to helpful resources. I’m excited that Tanya has given me the opportunity to offer to you a free class giveaway. ends tonight (Dec. 5) at 11:59 p.m.
one entry to win MUST be Pin this post, like Blogelina on Facebook, follow Blogelina on Twitter. Plus a bonus entry of subscribing to Practical Inspirations newsletter. You may have up to four entries. 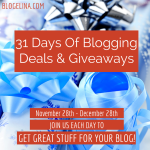 Don’t miss this opportunity to start or improve your blog.